Jupiter moves into Virgo today and will stay there until September 9th, 2016. Translated into Tarot, this transit might be described as the Wheel of Fortune taking the Hermit for a spin; the old guy has left his cave and is trying out something new. The Wheel of Fortune brings with it the opportunity to make positive change in our lives. It asks us to take chances and to do things a little differently than we might be accustomed to. When the Wheel’s around, we’re encouraged to break free of our comfort zones, especially if they’ve grown a little stale with time, and to do things that might develop new perspectives, and bring new energies into our daily existence. The Wheel of Fortune helps expand our world in terms of communication and expression, and it typically brings a healthy dose of good luck along with it. The Hermit, on the other hand, is much more comfortable doing his own thing, in the way that he’s always been doing it. Shaking things up is not something he’s particularly fond of. While the Hermit is often an excellent communicator when need-be, it’s not always easy for him to get out and share what he knows. He’s somewhat of a solitary thinker, and he’d usually rather mediate alone then speak out in a crowd. The Hermit encourages self-reflection, and reminds us that more often than not, we have all that we need within ourselves. For him, looking for insight or validation in the outer world is far less useful than looking for the truth from within. 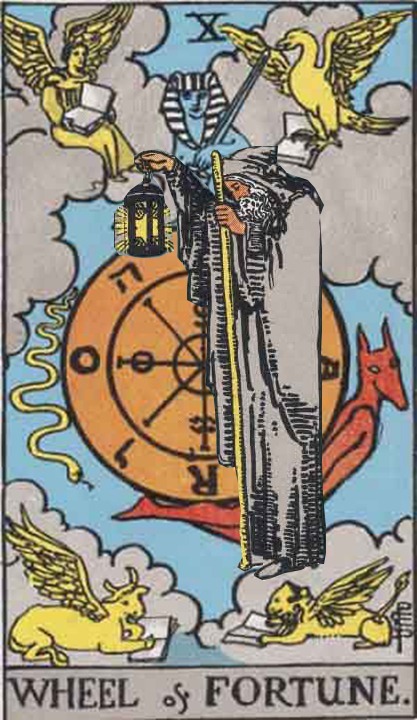 Though the Hermit might not have asked to go for a spin with the Wheel of Fortune, the change is probably good for him. It’s time now to let his internal light shine bright for the rest of the world to see. Jupiter in Virgo, or the Wheel of Fortune taking the Hermit for a spin, is a great time to clear away outmoded and stagnant attitudes while opening up to new ways of seeing ourselves and the world we’re living in. Share insights you might normally keep to yourself, and try not to be tricked into believing everyone else knows more than you do. This is a chance to let others see what you’ve got, as well as an opportunity to see how your own ideas play out in the bigger world. If you normally spend a lot of time alone, shift things up a bit and get outside to see what’s happening. And if you are usually out and about anyway, see if you can pay especial attention to situations or voices you might normally not pay much attention to, there’s likely a message there waiting for you to hear. One way or another, don’t be shy, or afraid to reach beyond you usual boundaries. You’ve got something to teach and something to learn, and getting out of your cave is the first step in that process. Jupiter moves into Leo today and will stay there until August 11, 2015. 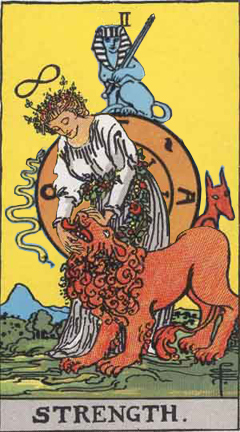 In Tarot terms, it’s like the Wheel of Fortune is spinning with Strength, the Maiden and her Lion are about to take a ride. The Wheel of Fortune asks us to shake things up and take chances, to move beyond our comfort zone and into a place where new opportunities can flourish. Doing things the way you’ve always done them might still work, but changing things around and trying something a little different is likely to work even better. And with the Wheel around, communication is at the forefront, especially activities involving publishing – electronic, or otherwise. Get your message out there and be ready to receive some new information back. Strength, on the other hand, isn’t so much about change as it is about intensity – fire and passion are its main focus. Rather than letting ourselves go this way and that with every passing fancy, Strength asks us to actively direct ourselves, to take control of our passions and get them working towards some worthy goal, something that matters to us on a soul level. Getting ahold of our ego is part of the challenge, and it can be tough. But if we succeed, like the Maiden with her Lion, we can play with true power without being eaten alive. The Wheel of Fortune and Strength are a formidable combination for sure, they represent positive new opportunities and the fortitude to make those opportunities grow into something real. Jupiter in Leo, or the Wheel of Fortune spinning with Strength, can be an exciting time, a chance to move forward with something that fills you with enthusiasm. And really, that’s the key during this period; to focus on those things that spark your enthusiasm, and challenge the way you’ve been doing things until now. It’s not about abandoning your obligations, or ignoring necessities, but to look at your world with fresh eyes, to be open to doing things differently, and to take the spinning Wheel of Fortune into your own hands. What do you want to create in your life? Whatever it is, this is an especially good time to make a wish, then make that wish real. Keep your ego in check, your enthusiasm high, and your eyes open for new ways of doing things. It might be hard not to have a good time. Jupiter moves into Cancer today and will stay there until July 16th, 2014. From a Tarot perspective, this transit is like the Wheel of Fortune is taking a spin on the Chariot. The Sphinxes are on the roll. The Wheel of Fortune could as easily be called the Wheel of Life. It represents the ups and downs of our journey on this wheel called Earth. Typically though, unless there’s something unpleasant around it, the Fortune described by this card is good. There’s a sense of hope that something excellent is just around the corner, and with that positive attitude, there usually is. The Wheel of Fortune asks us to try doing things a little differently, to go beyond our usual boundaries and to explore new opportunities. Mix it up, change things around and keep the Wheel spinning. The important thing is not to stop moving, or to stagnate in last year’s way of doing things. The Chariot very much appreciates this theme of movement. It has two wheels of its own, and is happiest when on the road. Strength, fortitude and endurance are hallmarks of this warrior. He doesn’t give up and he knows that staying in the game is three quarters of the battle. The Chariot represents the resolve to follow through on commitments already made, as well as the actions required to create change when necessary. The Wheel of Fortune fits comfortably on the Chariot. And with three wheels and three sphinxes, all kinds of magic are possible. Jupiter in Cancer, or the Wheel of Fortune taking a spin on the Chariot can be a time of exciting movement and unexpected opportunity. New possibilities are on the horizon and the power of perseverance is yours for the taking. Be open to what’s unfamiliar and think big. If you’re willing to take some chances and work towards hard your goals, you can hardly go wrong. Life on the road with the Chariot can get tiring at times, but with the Wheel of Fortune along for the ride, it’ll be well worth the trip. You are currently browsing the Tarot Jupiter Transits category at The Tarot Room.